Whitchurch is a small hamlet of less than 10 properties lying on the left bank of the River Stour. It occupies the site of an earlier larger village which was depopulated in the 15th and 16th centuries as the result of land clearance schemes carried out by the then lords of the manor. A Norman church dedicated to St Mary survives and is Grade 2 Listed. Saxon remains, a carved Jacobean pulpit and medieval glass all contribute to the attraction of this beautiful church. It now stands remote in the middle of the field and sheltered by trees and is a gloriously peaceful spot, close to the River Stour. St. Mary’s Church serves three other small hamlets, Wimpstone, Admington and Crimscote. The other evidence of the former village is seen when the River Stour floods and the area of the medieval fish ponds become visible. Wimpstone is a tiny hamlet of houses and farm buildings, and along with Whitchurch and Crimscote is now part of the parish of Preston on Stour. One notable property on the walk into the hamlet of Wimpstone is the Old Rectory, a period house built around 1839 and now a private residence. Preston on Stour is an estate village in a Conservation Area and one of the most unspoilt in Warwickshire, having seen very little new building since the mid-19th century. As the name of the village implies, the River Stour flows along its eastern fringe. The village was part of Gloucestershire until it changed counties in 1931. According to the Doomsday Book, Preston on Stour was owned by Deerhurst Priory, near Tewkesbury. With the Dissolution of the monasteries during the reign of Henry VIII, the manor of Preston on Stour and neighbouring Alscot (across the river) were sold. In 1747 both Preston and Alscot, along with the manors of Whitchurch, Wimpstone and Crimscote, were bought by James West, MP, and the son of a London Cloth Merchant. His family have owned the Alscot Estate ever since. The oldest building in the village is a timber-framed cottage dating back to the 16th century, and is reputed to have been a priest’s house. The 17th century timber-framed cottage next door to it is now the only thatched cottage building in the village. There are two adjoining cottages made of wattle and daub and two terraces of 18th or early 19th century brick cottages. There are also several notable properties such as the Old Vicarage and the old Manor House. In the 1850’s, James West rebuilt the Main Street of Preston on Stour as a model village. The school, at the southern end of the village, was the earliest feature, built in the 1840’s and taught the village children until it closed in 1974. Eight pairs of two-storey cottages, evenly spaced on each side of the road running up from the school to the Green, were built between 1852 and 1856. The heart of the village today takes in the Village Hall, the former school (a lovely example of a Victorian school building) St. Mary’s Church and the village green with its war memorial. The Village Hall, named The Three Parishes Millenium Hall is set at the southern edge of the village. The former school building is next to the Village Hall and part of which houses the village shop/Post Office, together with The Café and Tea Gardens. The parish church of St. Mary the Virgins was transferred from the Diocese of Gloucestershire to the Diocese of Coventry in 1918. The church of St. Mary’s and the churchyard, is rather like stepping back in time as you wander up the main footpath to the building. Sheep are still used to keep the grass down and the yew trees date back half a millennium. The church has a medieval tower, but the remainder was rebuilt in 1753-4 by Edward Woodward of Chipping Campden, and is a very early example of the Gothic revival. It contains several notable wall-mounted monuments from the 17th and 18th centuries. But it is the stained glass which takes centre stage, with a magnificent collection of continental roundels in the east window, and two superb and extremely unusual side windows by Joshua Price c1750, with standing saints flanked by an eccentric collection of portrait medallions. Alscot Park is a wonderfully restored country house and is set rurally in about 4000 acres of beautiful Warwickshire countryside, and headed by Emma Holman-West. The Alscot Estate is now a very successful and award winning business. 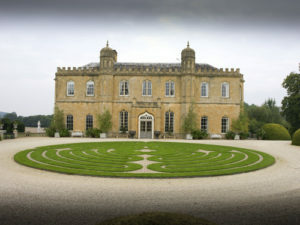 Alscot passed into Emma’s family in 1747, when it was purchased by James West, MP and Joint Secretary to the Exchequer, who bought Alscot Park to house his wonderful collection of art. Emma is the ninth generation of the West family to call Alscot Park home, and it is a magnificently preserved Grade 1 Rococo Gothic style house set in stunning parkland and countryside. The beautiful surrounding parkland is home to Highland cattle, fallow deer and Jacob sheep. There are some wonderful old trees in the grounds, in particular some Cedar trees, a venerable Tulip tree and a Sweet Chestnut. Atherstone on Stour is a small hamlet close to the River Stour. and a wall-mounted marble monument to William Thomas, who died in 1710. St. Mary’s is now redundant and in 2008 it was converted into a private house. Atherstone on Stour is now part of the parish of St. Mary the Virgins Church at Preston on Stour. One other notable property in the hamlet is the Georgian Old Rectory House, a Grade 2 Listed Building. Clifford Chambers is a village 2 miles south of Stratford upon Avon and until 2004 it was in its own parish, but it is now part of Clifford Chambers and Milcote. The village was in Gloucestershire until 1931 and belonged to the Abbey of St.Peter in Gloucester. The River Stour runs along the north-eastern side of the village. Today it is a pleasing village with nearly all the houses made of brick, but with some of the older ones being timber-framed or partly timber, most of which border a long Main Street that ends at the gates of The Manor House. 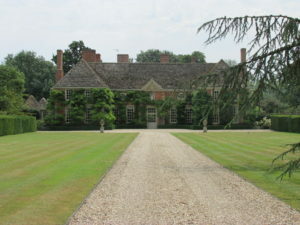 Many of the houses in the village were still owned by the occupants of The Manor House until after the Second World War. It is known that the moated Manor House was visited in the 16th century by several well-known poets of the time, such as Michael Drayton, Ben Jonson and William Shakespeare. This was because the father of the lady of the house was a patron to young poets at the time. The Manor House was remodelled by Edwin Lutyens in 1918, following a fire, and the garden design has been attributed to Lutyens and Gertrude Jekyll. The beautiful parish church of St. Helen’s is Grade 2 Listed and was rebuilt in the mid. 12th century and extensively restored in the late 19th century. The tower maybe 14th century and has traces of Saxon work. The village war memorial is on the churchyard corner of the The Square. Two notable properties close to the church are The Old Rectory and The Hollies (which is opposite). The Old School, now a private house, can be seen from outside the church, it is the building with the pointed bell tower. Further along Main Street is the Village Hall, named Jubilee Hall and built in 1939. Clifford Chambers has a public house called The New Inn Hotel and Restaurant and is set alongside the B4632 road. Car parking is available in the slip road for Weston and Welford, alongside the B4632 and opposite The New Inn Hotel.